Except, it now seems, in resource-rich federal waters in the Atlantic Ocean. The administration backpedaled on its promise to implement an all-of-the-above energy approach by deciding not to consider potential future oil and gas leasing at least 50 miles off the southeastern U.S. coast through 2022, despite the lease sale having been included in a plan that Interior Secretary Sally Jewell called “a balanced proposal” when announcing it last year. A few things, Jewell says. “When you factor in conflicts with national defense, economic activities such as fishing and tourism, and opposition from many local communities, it simply doesn’t make sense to move forward with any lease sales in the coming five years,” she explained. Let’s take a close look at the administration’s claims for flip-flopping on the Atlantic – and compare them with the facts. Claim: Defense Dept. (DOD) activities are too significant to include potential Atlantic lease sale. In truth, DOD has labeled approximately 5 percent of the proposed Atlantic leasing area as a no oil and gas activity area. While DOD has identified wind exclusion areas in the Atlantic, the Interior Department is working with them to find a solution for moving forward – not by removing any possibility of a lease sale. In the Gulf of Mexico, which has several DOD major operating areas, the Interior Departmenthas successfully coordinated with the DOD to ensure compatibility, pursuant to a 1983 agreement. Further, the DOD recommended set-aside areas are virtually the same as they were in early 2010, when the Obama administration took steps to move forward with a lease sale off Virginia before later canceling it for other reasons. In short, there are no new requested exclusion areas sufficient to justify the decision. 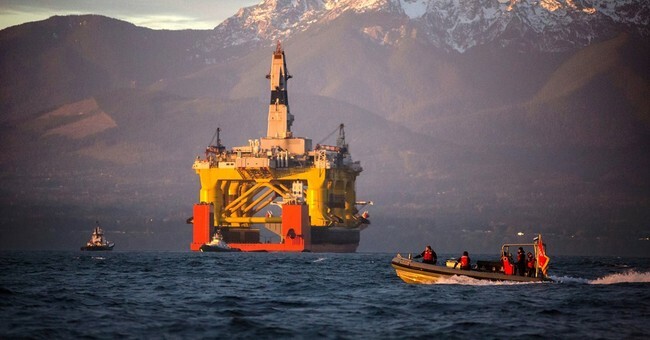 The Obama administration is using an extremely thin 5 percent of 123,803 square nautical miles offshore as a weak excuse to perpetuate what is now clearly an anti-fossil energy agenda. Claim: The opposition was too overwhelming to maintain the proposed Atlantic lease sale. The Interior Department received about 1.1 million public comments on last year’s proposal that included the Atlantic, over 50 percent of which were pro-Atlantic access. While cynics say that non-binding, anti-energy resolutions passed by local municipalities are proof of widespread opposition, they represent just 3.9 percent of the leasing region’s overall population. Furthermore, polling by Harris Interactive and Democratic polling firm Hickman Analytics shows that significant majorities within each of the proposed leasing region states support offshore development. Even the Interior Department noted how all states in the proposed Atlantic leasing region “supported inclusion of the OCS off their coasts in the 2017-2022 program.” The OCS Lands Act requires that the leasing program consider the input of states, with no such special provision for local or general public sentiment. In addition to the support of Democratic and Republican governors from the proposed Atlantic leasing region, numerous state legislators and congressional delegation members from both parties supported allowing this offshore opportunity to move forward. There was clearly broad support. Claim: Inclusion of the Atlantic lease sale is not currently relevant to U.S. energy security. In 2015, the U.S. imported more than 9.4 million barrels of crude oil and petroleum products per day. Utilizing federal estimates based on decades-old data, the proposed leasing region contains enough oil and natural gas to replace nearly 62 percent of U.S. imports from the Persian Gulf over a 15-year period. Consumers will continue to need oil and natural gas for many decades. This rationale from the administration simply defies all logic. Claim: There has been little history of coexistence between oil and gas and other uses in the Atlantic, and the proposal is designed to make areas available where infrastructure is mature. A license to operate is necessary to coexist with other uses – like in the Gulf of Mexico or the Arctic, where industry has coexisted with other uses. The proposed Atlantic leasing region also has existing infrastructure and assets in place, with ample time to add more by 2021, when the lease sale was slated. These infrastructure projects and investments would create jobs. Unfortunately, for now, rhetoric has won out over reason and economic growth. America used to be a regulatory model for the world, one that showed others how to do great things, environmentally and economically. We cannot claim to be that anymore, not in this environment defined by unprecedented, convoluted, ever-changing federal regulatory processes and conflicting agency decisions. By removing the proposed leasing area, the White House ignored some blatant, important facts while failing to present a serious offshore plan to help meet our future energy needs. Experts say that this U-turn will become a major issue in the upcoming presidential campaign season, that it underscores the need for nominees of both parties to bring forward thoughtful policies that will secure the nation’s long-term energy, economic, and national security and highlight how we can have responsible energy production and environmental protection. The next administration will have the chance to right this wrong and reverse course toward a more balanced, responsible energy approach. Let’s hope they do it.